Like many, I have been watching the Mars Curiosity with … curiosity. But along with the idea of a rover moving (slowly) around Mars, I’ve been fascinated by the ways that NASA and its supporters are leveraging Twitter, Youtube and other new media/technology elements to add a little pizzazz to its mission. And adding some very important fun, too. In the past few weeks, both Newsweek and Time magazines and a host of online sites have been featuring the ways that the rover is getting its news out. I just saw an interchange between Brittney Spears and the Rover via Twitter in one of the magazines. Odd? Yes. Interesting? You bet. The embedded video above is another example (although not created by NASA, it is a catchy example of celebrating science for the younger generation listening to LMFAO). Given the reduced funds for NASA space exploration and fears that science research is taking a back seat to other priorities, this push to make science relevant and fun with parody and pop culture is important. I know, for me, this mix of official and parody has made me pay attention. And I suspect maybe my students, too? PS – Thanks to Maria for a few additions to the twitter list. I’m starting to do some culling of our online spaces, making room for this year’s students while putting student accounts from last year out to pasture. In Bitstrips, a fantastic webcomic site that is easy to use, I created a new class but I am on the only person in it. My avatar sure seems lonely, doesn’t it? Don’t worry. In the first days of school, one of our activities is going into Bitstrips to create avatars and filling up the classroom spaces with students. It’s going to get crowded in here soon enough. Which had me thinking a bit about how accustomed we get to the set up and language of computer programs created by others, from some different time. 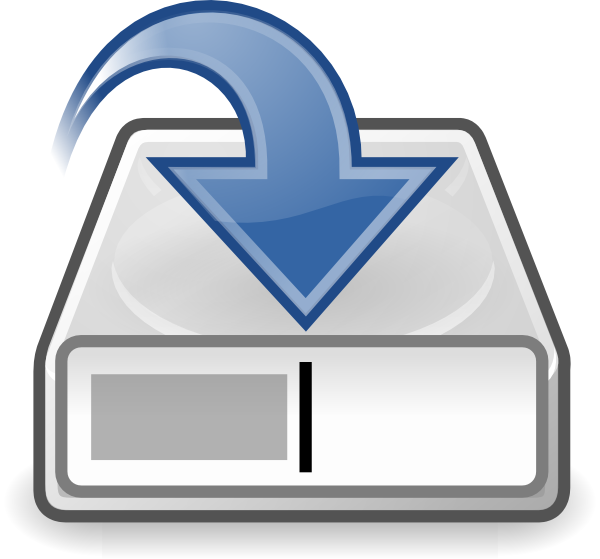 My guess is that the “save as” idea stems from Microsoft (but I could be wrong about that), and maybe Apple sees “duplicate” as more valuable, and adds a little Apple tweak to the language that confronts us when we write and create on our computers. I don’t know, but I know I get used to doing things a certain way and get flustered when I can’t do it that way anymore. I can adapt, for sure. But it takes time to learn those adaptations and that work moves me out of my surface comfort zone with technology. This an interesting view of a teacher reflecting on how design ideas can reshape learning experiences for students. While the video does not go into too many specifics, it is clear she and her colleagues and the school are undergoing inquiry to couple design ideas with education. I’m curious to know more about what that means, and how a school begins. (Design is) involves storytelling, sorting and condensing thoughts, until a compelling point of view and clear direction for ideation emerge. (The video was shared by VideoAmy over at Edutopia. See her entire playlist around design ideas in education for more information – you can also view the IDEO site, which is a design consultant that produced the video. They have a whole section on education). It’s interesting because a recent issue of Smithsonian Magazine is themed around design, and the legacy of Steve Jobs at Apple. The idea of simplicity, but not simple, is what is intriguing, I think, and how to make the form of something match it function without interfering with the function. In education, this raises questions about the roles of the classroom, the layout of the classroom and school, the experiences of students in a given day, and all the ways that we interact with other adults and with students. This is kind of interesting. I saw a tweet from a friend, Lacy, that I had “joined them” as a mentor text. Nice! And I didn’t even know I was there! But it was pretty cool to see chart paper notes from the session (not quite sure what the session was) as viewer/reader/participant commented about what they were seeing at my blog (as they think about their own blogs — that seems to be the activity). 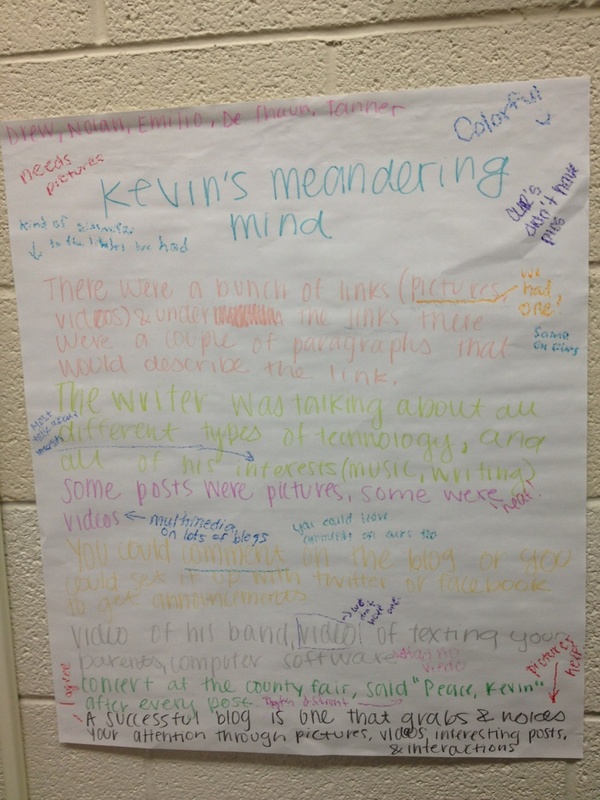 I decided to take the image of the chart paper notes, and use Thinglink to add some response notes back to them. One of the elements of online tools is this ever-decreasing space between writers and readers, and back again. 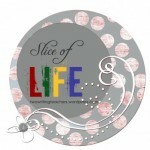 And I appreciated how this group’s reflections helped me see my blog from another angle. A recent writing prompt at our iAnthology writing space asked us to recommend books to read. I grabbed as many titles that had book trailers as I could find, and shared out this playlist. Maybe you will get inspired to read one of these, too. I suppose my slice is similar to just about every teacher who is slicing this week, or last week, or next week … depending on when your school year begins (or has begun). I’m feeling the summer fading and my anxiety about starting the year beginning to creep into the back of head (you know, that place that keeps you up at night?). Along with leading various professional development sessions (which invades that same part of the head), I am thinking about my curriculum, and doing some weeding and planting. 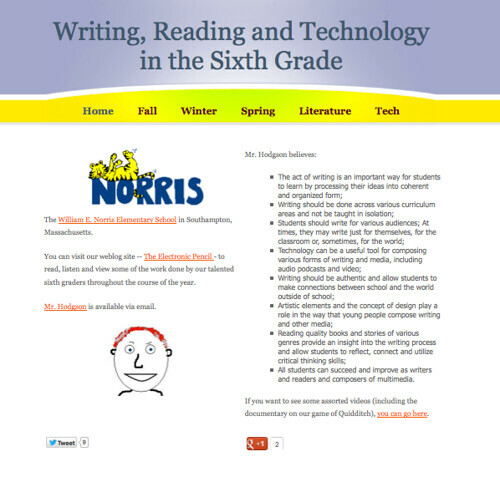 One way I do that is by visiting my website where I showcase the curriculum for my sixth graders. This allows me to revisit the previous year and start thinking: does this belong? How about this? As a result, I have solidified my decision to toss out our month-long puppet unit (a difficult decision) in favor of our video game design project, adding in a digital citizenship unit, began thinking of how to teach more informational text in conjunction with our novels, and tinkered here and there with various things. What I have added early in the year is an I Search research project, so that I can teach some basic skills around research, sources and critiquing websites. These skills were lacking last year, and I normally don’t get to it until the end of the year, which now seems pretty silly since they need to know how to do those things early. Duh. So, you can see what runs through my head in the middle of night …. 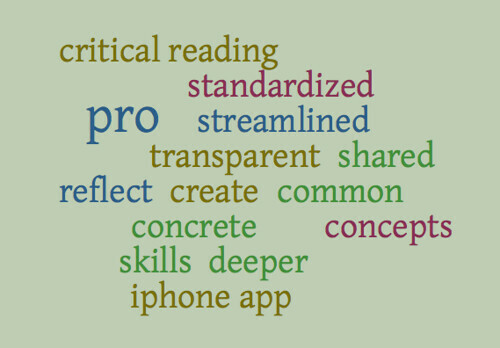 The participants did a bit of writing beforehand about what they knew about the Common Core, and this word cloud represents their thoughts about the pros, or positives, that they see in the new standards. We didn’t do the cons but we did talk about the things that worries them. In workshops, I try hard to remain neutral, and open, and let participants express their own views. I know, as a presenter, I must come across sometimes as an advocate of Common Core, but I am not necessarily that way. I can see the good, but I also have my own concerns, too. By the way, the hands-on work around digital storytelling flowed from some discussions around the Common Core’s standards related to media literacy, using the Internet for research and publication, collaboration and synthesizing ideas, all using student voice and stance. When you think about it, digital storytelling as a concept has a lot of potential for learning in the new standards, but you have to revamp the traditional definition of personal narrative into something larger, I think. While I did not have time to share this with the session yesterday, I did use it when I was at the school earlier in the spring. Here, I was trying to make connect connections between technology and the new standards. The other day, the drummer in our band — Duke Rushmore — posted this picture at our website. We all had a good laugh at those huge drum sticks. And then I remembered this tiny toy saxophone that I had in our basement, so I dug it up and added this image to our website. If you are in Western Massachusetts this coming weekend, our band is playing at the Three County Fair on Saturday afternoon. (We either start at 2 or 2:30 p.m.). Come say hello and maybe dance your shoes off before heading off to see the racing pigs, the demolition derby or scarfing down a pirogi. I’m leading a workshop this morning around Common Core and Digital Storytelling, and how technology can be used in the classroom. This is a hands-on session, and I want participants to be making digital stories. It occurred to me that using digital storytelling ideas to create book trailers is a valuable activity (and one that I have watched others in my Nerdy Book Club circle doing). So, here is a sample that I created for our summer reading novel, The Mostly True Adventures of Homer P. Figg by Rodman Philbrick. I did this one in iMovie, but our session is on PCs, so I will be doing a second version as a tutorial using Photostory3.